By Urbannizer, November 10, 2014 in Going Up! I feel bad for the condos on the lower half of the building. Really only the top two floors will have good views. Maybe the corner balconies on the lower floors have better views up and down Caroline. I'm happy to see these type of projects fill in the inner loop. The lower floors will probably be cheaper, which in my opinion, is good. Not everyone can afford a 300k condo. I like it. How big is the lot they are squeezing it on? The lower two floors are parking with four stories of condos above. I've always wondered what would happen to these boxed-in lots. I hope the tide is shifting away from town homes to higher density developments like this in Midtown. Do you have pricing info, floor plans, etc for any of these complexes available yet ? Yes we do. All floorplans and pricing are available on our website, www.surgehomes.com. Please be sure to register to see our full website and access the plans and pricing. Are the prices that low on something like this? I seriously doubt their 1b/1b units go for below 350k. Edit: I've registered and will check it out later. Really? Wow I am completely shocked! I haven't received my e-mail notification that I'm registered... I'm eager to see more. I finally got access. I knew there was a big catch. Actually that's a pretty small one.. The prices aren't too bad on the bigger units. At lot less then what is currently on the market (Apart from their bigger units Downtown). anyone know how many units there are? The exact number of units hasn't been determined yet. We are testing the idea of condos or single-family homes on our website to see which type of property there is more interest in. The condos are actually very nicely priced, the HOA fees aren't too shabby either. The $15,000 extra parking spot is a big frown from me. Will there be an amenities if they are built? I saw the pool for the Downtown units, but not on the Museum District or Midtown project. I'm super anxious to buy something, but I should probably be smart and not buy at the top of the market. That, and I plan to run away to New York City or Germany in 3 years. But there is also rental potential! I hope surge homes catches on and buys something in first ward. So much opportunity with the warehouses selling! Its refreshing to see a developer take the time to respond to questions and concerns. I noticed a response on Swamplot to concerns about signage and they took the sign down almost overnight once it was brought to their attention that it was in the bike right of way. I'm glad they are trying to play fair. I know some could care less. A bit off topic, but what's happening over by Memorial? Surge, what's the latest with 4819 Caroline? Still a wait and see on the condo? This one is more likely to be townhomes now. At Surge Homes' Museum District location, the developer was planning to build a six-story, 55-unit condominium project on Caroline Street. However, buyers wanted townhomes and single-family homes on the site instead, again because of the walkability of the neighborhood, Conrad said. Buyers wanted townhomes because of the walkability of the neighborhood? Dont condos also get you walkability? This is right across from the Oaks at Caroline. Having seen the site first hand, this is not surprising. It seemed too small for condos. They have had townhome renderings on the sign on the property for the last few weeks, so this makes sense. This one is a go, launch is October 3rd. 50 unit, prices from $144,300 to $327,292. Agreed. I don't know what clientele are looking to put up $50K or more for a down payment on a one bedroom unit. 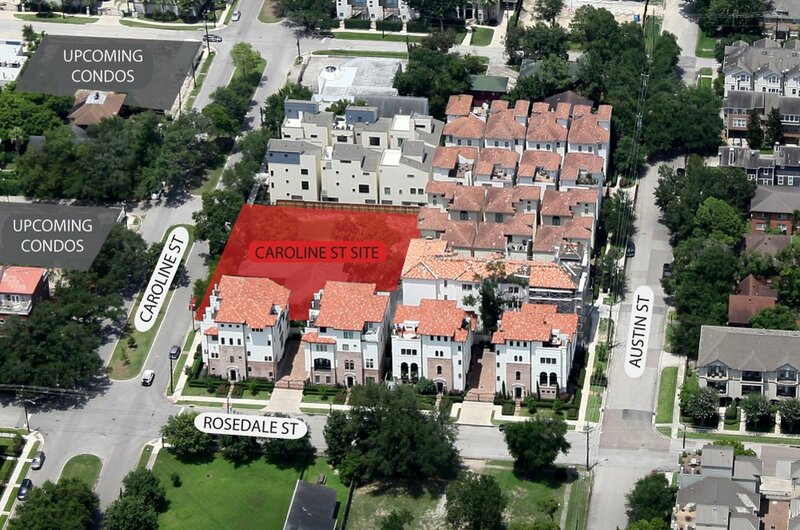 Located at 4819 Caroline Street, Museum BLVD is an $11 million, 50-condominium, mid-rise development, located in close proximity to the cultural and recreational amenities of the Museum District. Buyers can choose between lofts, one-and two-bedroom homes, and penthouses with large terraces and skyline views that range from 420 square feet to 1,099 square feet and include private, reserved parking in the gated garage on the building's first floor. Homes are priced from the $140s to the $340s, which are in contrast to the median home values of $745,000 in the Rice/Museum District market area, as cited by the Houston Association of Realtors. Museum BLVD attracted more than 100 interested buyers, each of whom put a $1,900 deposit down to reserve the right to purchase one of 49 condo units. The $11 million condo project is proposed for 4819 Caroline St. in the Museum District, where the median home price is $745,000. Condos in Museum BLVD range in size from 420 to 1,099 square feet and in price from $140,000s to the $340,000s. Yeah but think of how many times you get to say "ayyy sqft blaze it"
420 sqft at $140,000 in the this location is much better than what The Ivy was attempting with 304 sqft at $120,000 in east downtown. Over 100 deposits shows there's a lot demand. If this works out well, I wonder if Surge would have any interest in the land being sold by the Oaks on Caroline developer just across the way. They seem to have found a good price point for these types of projects. HOUSTON – Museum Boulevard Condominiums, a residential building in Houston’s Museum District has obtained construction financing, according to Transwestern’s Structured Finance Group. Fenced off, cleared and some culvert pipes on site. Construction has begun on a 37-unit mid-rise condominium project in the Museum District. After preselling more than 50 percent of the condos, Houston-based Surge Homes secured construction financing through the Houston office of Dallas-based PlainsCapital Bank to build Museum Blvd, according to a press release. Construction began in May on the $12 million project, which is expected to be completed fall 2019, a spokesperson said. They’re moving dirt and laying the plumbing. Plumbers were cutting out the street to hook up the city sewer lines.